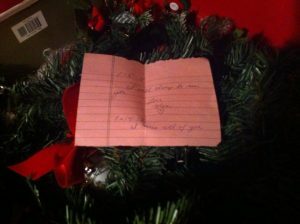 Reblogging one of my all-time favorite stories about my Mom, Christmas, and hope after loss. Enjoy. A few weeks after my bodybuilding competition, around Halloween, my sister Nicole and my nephews, Matthew age 11 and Sean age 5, came over to hang out. My sister all of a sudden had a desire to decorate the house like our Mom used to. My mom was beyond festive. She decorated the house for every holiday. It was adorable and sweet and so fun to walk into the house, even around St. Patrick’s Day, and see little shamrocks everywhere and the house decorated in green decorations. You know how most people just have boxes in their basement labeled “Christmas”? Yeah, we have ones labeled “Easter” Valentine’s Day” “Memorial Day” “Halloween.” You get the drift.